Putting stainless steel brake lines on your old car ranks right up there with sliced bread as a cool, modern invention. When you "hit the brakes," your foot on the pedal creates hydraulic pressure that travels through metal brake lines and rubber brake hoses to the wheel cylinders. Pistons in each wheel cylinder force friction pads against a metal drum or rotor so the wheel stops turning. When it comes to upgrading the mechanical operation of your brakes there are limited options open to you. If you own a muscle car, you might find sintered metallic brake linings or high-performance brake calipers or rotors. But if you are working on a Stanley or a Stutz or a Studebaker, just finding replacement parts is enough of a challenge — nevermind upgrading the system. A Minneapolis firm named Brake & Equipment Warehouse can help with parts. It stocks over 45,000 vintage brake parts from brand-name manufacturers. Brake system hydraulics, on the other hand, can be upgraded on any old car by having the brake master cylinder and wheel cylinders sleeved with stainless steel and using pre-bent "never-rust" stainless steel brake lines. These are available for hundreds of vintage cars including those in your collection. 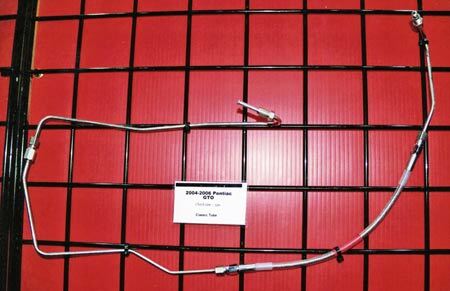 Start by inspecting your original-equipment brake lines. Check for nicks, fluid leakage, kinks and rust on the brake lines. Large build-ups of road grime can trap moisture, so you'll want to clean any dirt away before problems begin. Compare the design of your system with illustrations in a shop manual for your car. Then check the Websites and or print catalogs of companies such as Classic Tube or Inline Tube. If they say the car should have five brake lines and you car has six, something has been changed. On one of my cars someone had replaced a long line with two shorter ones joined in the middle. A leak developed at the joint. Maybe factory engineers knew what they were doing when they designed a five-piece system in 1953. 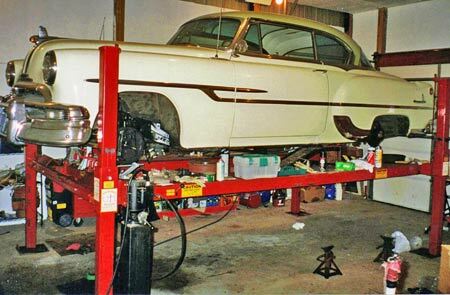 This '53 Pontiac had aftermarket brake lines with six sections instead of the original five. The splice in one long line is where the leak occurred. While the installation of brake lines often seems to require special skills, experience and tools, most do-it-yourselfers should be able to replace a brake line. Basic hand tools will handle most work involved, though you'll need a 6-point flare nut wrench. This is a wrench that is almost closed, but has an opening large enough to slip over the brake line. The six-pointed end fits snugly on the brake line fitting. The snug fit keeps it from ruining the soft brass fittings. Brake lines run to brake line hoses, so you'll need to deal with removing those, too. The car will have three hoses if it has a solid rear axle housing. One will run to each front wheel cylinder and there will be only one at the rear. This line will be connected to a junction block on the axle housing on one end and to a brake line, held in a frame bracket, at the other end. Cars with transaxles will have two hoses up front and two in the rear. If one front hose is bad, replace both. If you have two rear hoses, follow this advice, too. On cars with disc brakes, the hoses will run to a caliper rather than to a wheel cylinder. The basic steps involved in replacing a brake hose start with securing the car so it won't roll. If working on the ground, use the parking brake and put chocks under the wheels on the side of the car opposite where you are working. If working on a lift, follow the lift maker's instructions to firmly secure the car. Use an open-end wrench on the brake hose fitting at the frame bracket that holds the hose to the frame of the car. Use your 6-point flare-nut wrench to turn the brake line fitting at the frame bracket. Once the fitting is loose, hold the open-end wrench to the brake hose fitting, unscrew the brake line fitting and work the fitting back and fourth a quarter turn until it frees. Then unscrew it from the brake hose. Use a hammer and punch to remove the horseshoe clip that holds the brake hose fitting to the frame bracket. Tap against the bent over top edge of the clip until it comes loose. Pull the old brake hose off the frame bracket. Long pre-bent stainless steel brake lines come with "shipping bends" in them. These are tagged and must be straightened prior to installation. With the open-end wrench, work the brake hose fitting loose on the other end of the hose where it attaches to the wheel cylinder or caliper. You may need to use WD-40. Remove the old hose. Obtain the proper replacement or have one made. Attach the new hose by reversing these steps. Now, position the other side of the hose in the frame support bracket. Push it through the bracket and hold it in position on the other side of the bracket with the horseshoe clip, which you can drive over the depression in the hose coupling with a mallet or hammer. Now, insert the brake line fitting into the brake hose coupling and tighten with your 6-point flare-nut wrench while holding the brake hose fitting from turning with your open-end wrench. Bleed the brakes. Check that everything is tight and carefully give the car a road test. At first, test everything at low speed, so the emergency brake can stop the car if there's a problem. It takes some degree of expertise to install new pre-bent brake lines that have lots of bends and angles. Earlier we mentioned upgrades you can make to virtually any classic car that uses hydraulic brakes. Having the master cylinder and wheel cylinders sleeved with stainless steel is one. A leaky cylinder is usually caused by rust and pits forming inside the cylinder bore, especially during storage. The pitting allows brake fluid to leak around the rubber cups on the pistons. Sleeving the bores with stainless steel eliminates rust. If you visit www.brakeplace.com you will be able to see the machines used to do this and how it is done. Apple Hydraulics, White Post Restorations and Stainless Steel Brakes also offer this service. All do a good job. Compare prices. After sleeving the cylinders with stainless steel, go all the way and get a set of stainless steel brake lines? They cost more than mild steel lines, but they will never rust again. That means that your brake lines will last as long as you own the car. You won't have to redo the brakes on a stored car every three years. In the long run, you'll save money. Classic Tube and Inline Tube are leading suppliers of pre-bent stainless steel brake lines. Some restorers like to replace stock brake lines with braided stainless steel hoses. The advantage of this modification is that the flexible braided hoses are easier to route along the chassis than solid brake lines. They also look great, which is why street rodders and muscle car builders like them. They will decrease the originality of the vehicle. They could also affect your insurance coverage because, even though they look/work great, they are not OEM parts. You may want to use silicone brake fluid (Dot 5 fluid) in your rebuilt hydraulic system. Some hobbyists swear by it and others swear at it. Conventonal (Dot 3/Dot 4) brake fluid is hydroscopic. That means it can absorb moisture. Silicone (Dot 5) brake fluid does not absorb moisture. This reduces rusting and corrosion inside the brake system. Some restorers say they experience problems with brake light switches and rubber parts when silicone brake fluid is used. U.S. Army tests done years ago say silicone brake fluid works. Dot 6 is in three cars I own that are stored all winter and the brakes on all three cars work perfectly year after year. In reality, it shouldn't matter if you use Dot 3 or Dot 5, as long as you change to sleeved cylinders and use stainless steel brake lines. With stainless used throughout your brake system, you can continue using conventional brake fluid and you should never experience rusting or pitting of major parts.